Most of other languages like C/C++ and Java require specifying what kind of data it can hold, but in PHP there is no need to specifying data type before using it. All the data store in PHP variable. 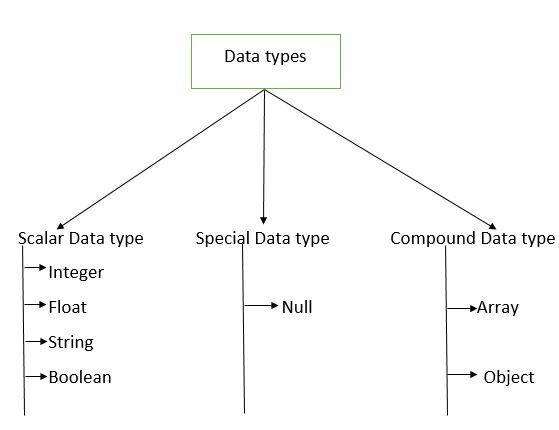 Data types are the backbone of any programming language. In this example $test, $test1 are the float type variable, after multiplying the $test and $test1 store the value into $sum variable. You can use gettype function to check the data type of the variable. Scalar data means data that contains only a single value. There are four scalar data types. All are scalar data types are following below. An integer is an integral whole number without a decimal point. Integer numbers are used for counting purposes, like 38, 8 etc. Float variables hold Fractional, like 38.025, 7.652 etc. It's used for banking and financial sector calculation. A string is defined as a character array, like John, car etc. It's used for storing the array of character. Boolean variables hold true or false. In the above example $a is not a string variable, it's a boolean variable and hold the value "true". So that the result will be "value of variable a is true". PHP supports two compound types, Compound data is data that can contain more than one value. In this example $number is an array variable that holds some integer value, you can access all the value of an array by using a foreach loop as shown above. It may contain null as a value. It is a special data type. NULL is not a string it is a special data type that means variable does not have any value, you can check by using if-else. You can use the gettype() function to check the data type of variable, gettype function returns the data type as a string. In this example, $test is an array variable that holds the integer, string, double and NULL values respectively. You can use a foreach loop to access array element one by one, pass the $value as an argument in the gettype function and it returns the data type of each element of the array. The function has their own scope, that means the variable used in within a function not available outside the function. The variable $a or $b not accessible outside the function concat, it's limited in the in that function, so it's called local variables. All variable set outside the function considered as global that means they can access from anywhere in the script. $global = "Welcome to php"." // Displays "Welcome to php"
Global variable accessible anywhere in PHP script using the global keyword. A static variable will not erase its value when the function terminates. It keeps the previous store value, used if the function again called. In case of non-static variable previous value will lose and initialised with zero again every time count function called. echo "count: " . counta() . " echo " count: " . counta() . " In case of static variable previous value never lost whenever function terminates. It keeps previous value.